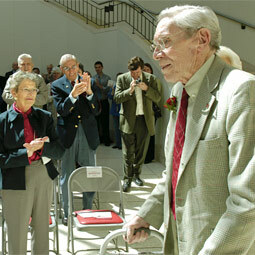 Last spring, amid smiles and tears and tales from years past, nearly 100 Washington State University officials, students, alumni, and faculty gathered in the atrium of the New Library to rename the 1994 building the Terrell Library in honor of president emeritus Glenn Terrell. Ever warm and easygoing, Terrell, who had traveled from Seattle with his wife, Gail, accepted applause, hugs, and handshakes from his friends and former staff before sitting down to the dedication. At the May event, Terrell said that the dedication of that particular building was especially meaningful, since the library is truly the center of the University.